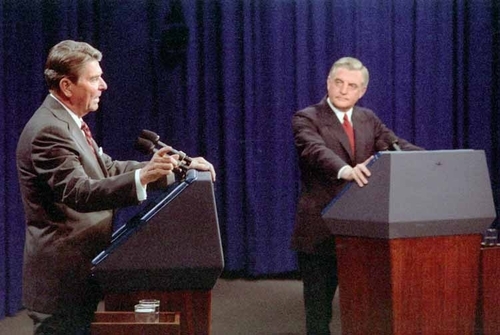 President Ronald Reagan and Democratic nominee Walter Mondale debate foreign policy in Kansas City, Missouri, during the 1984 presidential campaign. ONE OF the country's most experienced political commentators, a senior columnist at The New York Times, bemoans the disgraceful spectacles that presidential debates have turned into. "These high-stakes showdowns," he writes, "are gushing fountains of misinformation, disinformation, posturing, prevarication, and puerility." The nation's foremost TV news anchor agrees. "The debates are a part of the unconscionable fraud that our political campaigns have become," he tells an audience at Harvard's Kennedy School of Government. He lambasts cynical candidates — abetted by ratings-uber-alles networks — who agree to debate "only with the guarantee of a format that defies meaningful discourse." The crowd applauds when he adds: "They should be charged with sabotaging the electoral process." Such scorching criticism is not hard to fathom. The seemingly endless 2016 campaign season has inflicted voters with one cringe-worthy debate exchange after another. From Donald Trump's phallic allusions to Hillary Clinton's enemies list, from Ben Carson pleading for someone to "attack me, please" to Megyn Kelley's "wherever," from the undisguised partisanship of the CNBC moderators to the stuck-record repetition of Marco Rubio's talking points, the televised face-offs have amounted to little more than smackdown competitions — like raucous reality TV, only worse. But the celebrated journalists quoted above weren't deploring the disagreeable debates of the current race for the White House. Their observations were made 25 years ago. The columnist was Tom Wicker, writing on The New York Times op-ed page in May 1991. The TV anchor was CBS legend Walter Cronkite, speaking at Harvard a few months earlier. Both men have since died (Wicker in 2011, Cronkite in 2009), which spared them from witnessing the degrading cage matches that have passed for debates in the present election cycle. The quality of presidential campaign debates in the modern era, low to begin with, has sunk to rock-bottom. Some of that has to do with the declining moral caliber of the candidates themselves. Ronald Reagan and Jimmy Carter were statesmen of unimpeachable rectitude compared with integrity-challenged sleazoids like Donald Trump and Hillary Clinton. But the deeper problem is that presidential "debates" aren't debates at all. They are designed to minimize any honest discussion of policy differences, and to maximize reliance on safe, scripted sound bites. With rules that allow only 60- or 90-second responses, shallowness is guaranteed. With candidates entitled to speak anytime someone mentions their name, personal attacks and counterattacks dominate the discussion. Instead of serving to advance the candidates' ideas by allowing them to explain their differing approaches to important issues, the TV debates are crafted to prevent depth, nuance, and convincing argumentation. When was the last time you changed your mind on a controversial subject because you were persuaded by a candidate's reasoning during a debate? In real debates, the foremost objective is to convince those listening to alter their view. In presidential debates, it is to deflect "gotcha" questions and to score political points by embarrassing another candidate or rebuking the moderator. American democracy, and the American presidency, deserve better than this quadrennial roadshow of taunts and tawdriness. Thoughtful, meaningful, elevated debates are possible, even in the "Real Housewives" era. And if the experience of Intelligence Squared is any indication, there is a real thirst for such debates. Launched in 2006, Intelligence Squared is a nonprofit, nonpartisan organization that arranges traditional, "Oxford-style" debates before public audiences — about 120 of them so far, on topics ranging across the spectrum of public policy and world affairs. Its goal is to promote "intelligent discussion, grounded in facts and informed by reasoned analysis." In practice, that means arranging debates on specific resolutions, with four debaters — two arguing for the resolution and two arguing against. Among the questions debated in recent programs: Should corporate subsidies be eliminated? Are hunters good for conservation? Is free speech threatened on college campuses? Should the United States admit 100,000 Syrian refugees? There is a real public thirst for substantive, "Oxford-style" debates like those organized by the nonprofit group Intelligence Squared. 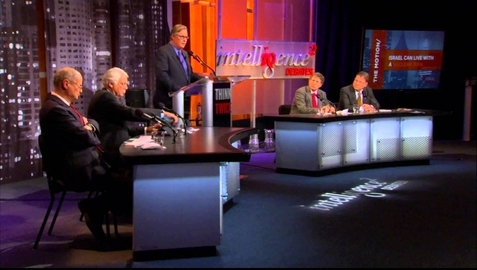 Above, newsman John Donvan moderates a 2013 debate on the Iranian nuclear threat. There are no ad hominem put-downs in Intelligence Squared debates. No shouting matches. No repetition of empty slogans. No ducking the issue at hand. There are, on the other hand, debaters who come prepared to defend their position and refute their opponents' arguments. And there are audiences, typically rapt with interest, who vote twice on the resolution being debated, once before the debate begins, once after it concludes. The team that swayed the most audience members between the two votes is declared the winner. Nearly every debate is lively, respectful, stimulating, absorbing, and informative. They have proved enormously popular, selling out theaters and reaching vast numbers of viewers online. Can you imagine presidential debates being like that? John Donvan and Robert Rosenkranz can. Donvan, a longtime correspondent for ABC News, is the moderator of the Intelligence Squared debates; Rosenkranz, a highly successful business executive, is the organization's chairman. The two have launched a Change.org petition urging the Clinton and Trump campaigns, along with the Commission on Presidential Debates — the organization that oversees the general-election debates — to adopt the format used by Intelligence Squared. "An Oxford-style debate would force the candidates to respond to intense questions, marshal relevant facts, and expose weaknesses in their opponents' arguments," reads the petition, which has so far garnered more than 50,000 signatures (including mine). It's a long shot, of course — the candidates have a vested interest in the current setup, and the commission is unlikely to change the rules of the fall debates unless both major parties consent. And consent will only come when public pressure becomes too intense to ignore. So let's intensify it. If watching presidential debates leaves you wanting to take a shower, or if you're one of the swelling number of voters who simply refuse to watch them, add your voice to those calling for reform. Watch Intelligence Squared's brief video explaining its petition, and sign if you agree. There are a lot of things wrong with American politics, this year more than ever. Genuine debates — substantive, civil, informed — won't make presidential campaigns lovable. But they could make them, at least, a little less horrible.